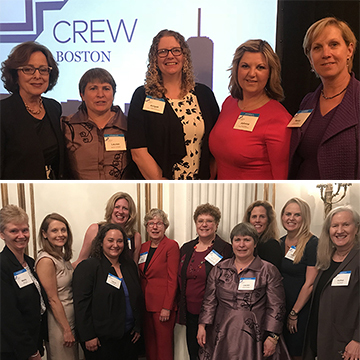 At the annual Achievement Awards reception held in April, CREW Boston recognizes the unique talents and accomplishments of selected CREW Boston members. Each year, members are honored for their contributions and achievements that advance CREW Boston's goals and objectives. In addition to our Achievement Award honorees, we also recognize two very special groups, our Mentor/Mentee program, as well as the cohort of members from our Leadership Academy. Through these three groups that we recognize – our earnest Mentees; our future Leaders; and our esteemed Achievers – attendees see how the CREW organization supports its members as they grow both personally and professionally at all stages in their careers. The Awards Committee solicits nominations from the membership at large, reviews candidates, designates recipients and plans the annual reception. The committee meets monthly from November through April. The 19th annual Achievement Awards took place on April 26 at the Fairmont Copley Plaza with 300 guests gathered to honor 18 members for their outstanding and impressive accomplishments in commercial real estate. CREW Boston President, Cara Nelson welcomed everyone and thanked all our sponsors, especially Mintz, Levin, Cohn, Ferris, Glovsky, and Popeo PC and New England Development for being our Corporate Sponsors. Incoming president Lisa Serafin with Redgate thanked the 2016 Leadership Recipient Kristin Blount with Colliers International for sharing this special evening with CREW Boston as the master of ceremonies and invited everyone to moving across the hall to the ballroom for food, drinks and a lot of networking.